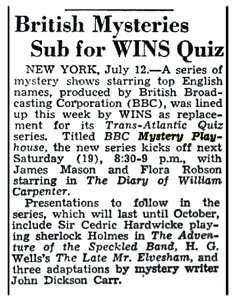 June 5th 1948 The Billboard chart cites Mutual moving its Mystery Playhouse into a Summer replacement slot for The Adventures of Sherlock Holmes. Premiere Date(s) and Title(s): 46-10-05 01 Murder With A High I.Q. Murder With A High I.Q. 8 p.m.--Mystery Playhouse (WGN): "Murder With a High I.Q." 8 p.m.--Mystery Playhouse (WGN): "The Third Key." 8 p.m.--Mystery Playhouse (WGN): "Death At My Shoulder." 8 p.m.--Mystery Playhouse (WGN): "We Find You Guilty." 8 p.m.--Mystery Playhouse (WGN): "Three to Go," story of dying man who decides to murder his three enemies. 8 p.m.--Mystery Playhouse (WGN): "Detectives Die Young." 8 p.m.--Mystery Playhouse (WGN): "Guilty Minus One. 8 p.m.--Mystery Playhouse (WGN): "Crazy Over Guns." 8 p.m.--Mystery Playhouse (WGN): "Murder Likes Company." 8 p.m.--Mystery Playhouse (WGN): "The Hero Is A Heel." 8 p.m.--Mystery Playhouse (WGN): "Murder--Win or Place." 8 p.m.--Mystery Playhouse (WGN): Forrest Lewis, Nannette Sargent in "Ring Out the Old." 8:00--W-G-N--Mystery Playhouse: "The Victim--Right or Wrong." 8 p.m.--Mystery Playhouse (WGN): "The Death Card." 8:00 Mystery Playhouse: Forrest Lewis in "The Death Care." 8:00--W-G-N--Mystery Plalyhouse: Forrest Lewis and Nannette Sargent in "The Death Card." 8 p.m.--Mystery Playhouse (WGN): Murder Me, Darling." 8 p.m.--Mystery Playhouse (WGN): "The Man With No Vices." 8 p.m.--Mystery Playhouse (WGN): "Murder Is My Alibi." 8 p.m.--Mystery Theater (WGN): "Red Rum--Spelled Backwards." MBS reports three more of its summer replacements have been set. 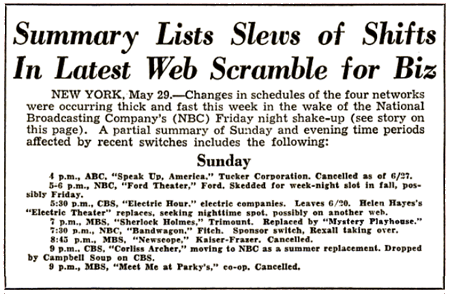 They begin: June 6 Under Arrest, police drama, for The Shadow; June 27 Mystery Playhouse, revivals of crime dramas, for Sherlock Holmes; July 4, It's A Living interviews with persons having unusual job. 5 p.m.--Mystery Playhouse (WGN): new series of radio revivals: "Killer," by Jay Bennett (on WKOW at 6). 5 p.m.--Mystery Playhouse (WGN): Kenneth Elliot's "The Weight of the Evidence" (on WKOW at 6). 7:00--MYSTERY PLAYHOUSE--Radio's anthology series represents Joseph Driscoll's unusual story, "Lease of Death." 7:00--MYSTERY PLAYHOUSE--The mystery anthology series represents "A Bullet Is a Sure Thing." Sunday 7:00--MYSTERY PLAYHOUSE--The series presents a British drama, "The Bell Tower," by H. Colin Rice.